Activist and political dissident Jorge Luis García Pérez, usually known as Antúnez, began a hunger strike on 17 February, in protest at the human rights situation in Cuba. Since 17 March, police and State Security officers have surrounded his house, threatening him, his wife Tamara Pérez Aguilera, Carlos Michael Morales, Diosiris Santana Pérez and Ernesto Mederos Arrozarena who joined him in the hunger strike. All five are in grave danger. Antúnez and his companions are carrying out their protest at his house, in the town of Placetas, 300km east of the capital, Havana. They are calling on the authorities to stop the "repression and torture" of Antúnez'sbrother-in-law, Mario Alberto Pérez Aguilera, who is imprisoned at Santa Clara Provincial Prison. They are also calling for the release of political prisoners, the ratification ofhuman rights treaties and provision of adequate housing to all Cubans. On 15 March, with their health failing, the group switched from a hunger strike to a restricted diet, eating only fruit and drinking fruit juice. Since 17 March, at least 20 state security and police officers have been keeping guard in front of Antúnez’s house and have cordoned off the street, stopping friends and relatives trying to visit Antúnez. No one has been allowed to approach the house. Antúnez’s brother has tried to visit him several times, and been detained every time. According to Antúnez, the officers keeping guard have shouted, "Antúnez, if you don't quit this protest you're going to die" (Antúnez o te mueres o suspendes esta protesta). He told Amnesty International that on the night of 25 March, pepper spray was fired into the house through an open window. On other nights, the house has been pelted with stones, and a pile of rubbish has been dumped at the house entrance. Carlos Michael Morales and another man who had been taking part in the hunger strike were arrested on 2 March at Placetas Hospital after they went to seek medical treatment. Carlos Michael Morales was given eight days' house arrest, after which he managed to return to Antúnez's house to resume his protest. Antúnez told Amnesty International that "the siege to my home prevents us from getting almost any of the provisions we need to continue our fast, or any medicine" (Este asedio a mi vivienda impide que podamos ya casi proveernos de los insumos necesarios para continuar haciendo este ayuno liquido así como para adquirir medicamentos). Antúnez is a well-known dissident, who was released in April 2007 after 17 years in prison. He had been detained in 1990 and sentenced to five years on a charge of "enemy propaganda." In May 1993 he was sentenced to an overall total of 15 years' imprisonment on new charges of "enemy propaganda," "attempted sabotage" and "illegal possession of a weapon," all supposedly committed while he was briefly at liberty afterescapingin October 1992. His sentence was later increased for "attempted escape." I am proud to hand over the keys to a guest blogger. Editor's note: Read more about the demonstration here. The U.S. Naval Base at Guantanamo is not really American territory, which is why the Bush administration saw it has the perfect place to hold suspected al-Qaida and other terrorists without having to worry about their constitutional rights to a lawyer or to not be tortured. The U.S. Naval Base at Guantanmo is not really American territory, which is why three Cubans who sought political asylum there are now in Cuban prisons, according to a report posted at Payo Libre. The dissidents Romenico Clape Noguera and Demis Flores Noguera, as well as Flores' boyfriend Eider Laborit Ramírez, all of Baracoa in far eastern Cuba, landed by sea on Gitmo on Aug. 12. They asked American authorities for political asylum, but they were instead treated as illegal aliens and on Oct. 17 handed over to Cuban officials, according to Néstor Rodríguez Lobaina, president of the Cuban Youth Movement for Democracy. Clape and Flores are members of Rodríguez's group. Earlier, there was hope that the three were in the United States. But Rodríguez said he learned of their status — they reportedly are under investigation for "disobedience" — after one of them wrote a letter from a Cuban jail to a family member. "All I know is that they were held incommunicado, under complete silence, and receiving humiliating and degrading treatment," Rodríguez said. "We thought they had gone to the United States, but no, they were in Cuba as prisoners. ... That surprised us. I don't understand how the Americans could return two dissidents, knowing the danger of a Cuban prison." The irony, of course, is if the three had landed on "real" American territory, like the state of Florida, their feet would have been "dry" enough to stay in the land of of the free and the brave. But as they learned, the bravery they displayed trying to escape FidelRaul Castro's Cuba, has only earned them — with the complicity of a nation they thought would have helped them — a spot in their gulag. The embarrassment and shame that Americans should feel for what has happened at the Guantanamo Bay Naval Base since 2001 has only gotten worse. "The crisis that Cuba suffered has made it a better place in certain aspects, as people had to become more resilient and self-sufficient and less wasteful. ... Although Cubans would certainly say that their food shortages and lack of inputs has been a hardship." The Cuban photographer Claudio Fuentes Madan has written a first-hand account of his recent trip from Havana to Placetas, in Santa Clara province, to show his solidarity with Jorge Luis García Pérez (Antúnez), who since Feb. 17 has been on a hunger strike/liquid fast demanding respect for human rights. I remember that we reached an agreement of ideas in the things we talked about: the different people who hope for and attempt changes in Cuba, those who question the laws and measures of the fifty-year-old government, those who, on great many occasions, have been on the receiving end of every kind of repression, harassment and violation of their most basic civil rights. We don’t think alike in our analyses of methods and ways when facing the same situation of aberrant deficiencies in which the majority finds itself. But along with the disagreements over chosen strategies, there exists a magnificent concurrent point: we all want the whole range of historically known freedoms, which I won’t talk about, and each day, not only outside Cuba, but from the very entrails of the sparsely bearded one there are more who confront them, out of personal courage, even, of course, at the risk of errors that will take place along the way. Read the whole thing, including Fuentes' litany of the rights that were violated when he was arrested and detained, here. A slow roundup of Cuban opposition activists in the province of Guantánamo in eastern Cuba for six months, with the secret police and imprisoning at least seven people because of their human rights and political activities. The crackdown was launched in response to the appearance of bumper stickers and other signs calling for CAMBIO, or "change," and for Cubans to not cooperate with the Castro dictatorship. The two latest to be imprisoned are Rodolfo Barthelemy Cobas and Alejandro Jiménez Blanco. Barthelemy, 37, was arrested March 23. His relatives said the authorities had re-instituted a 15-year prison sentence that Bathelemy, president of the Citizens Committee on Human Rights, had received in 1993 after he was caught trying to leave Cuba without government permission. Independent journalist Juan Carlos González Leiva reports that Bathelemy was expected to be held in the Guantánamo Provincial Prison until May. Jiménez, a member of the Cuban Youth Movement for Democracy, on March 18 was convicted of the supposed crimes of "contempt" and "resistance," and sentenced to 2 years in prison. For his trial, the authorities let in only a handful of Jiménez's family members and cordoned off the courthouse in the town of Baracoa to prevent other government opponents from attending, according to another report filed by González Leiva. Jiménez had been arrested the night of March 14 after police assaulted him and broke several bones. The attack came when Jiménez dared to raise his voice and criticize the police, according to González Leiva. The other Guantánamo activists arrested and imprisoned in recent months — most of whom I have profiled previously on this blog — are Isael Poveda Silva, Yordi García Fournier, Julián Antonio Monet Borrero, Ricardo Galván Casal and Abel López Pérez. Just ask Orlando Zapata Tamayo, who recently was operated on because of a tumor on his spine brought on by a beating by a prison guard; and Juan Carlos Herrera Acosta, who certain must be sick and tired of being sick and tired. The Miami Herald has more on Antunez's protest. Like the band of Nazi wannabes that it is, the Castro dictatorship has taken its fight with Cuban dissident Jorge Luis García Pérez (Antúnez) to a new, more frightening level. The home of former political prisoner and leading opposition activist Jorge Luis García Pérez, better known as “Antúnez,” was attacked in the pre-dawn hours of Wednesday March 25th by State Security agents. Antúnez and several other activists staying with him have been engaged in a protest involving weeks-long hunger strikes and fasts since February 17th. “At around 2:30 in the morning, we were awoken by fasting activists Carlos Michael Morales, Diosiris Santana Pérez and Ernesto Mederos Arrozarena who alerted us that State Security officers were releasing gas inside the home. (Antúnez's wife) Iris and I were in a room in the back of the home. When we went to the living room, I smelled a strong odor of gas and felt myself become short of breath. When Iris Tamara Pérez Aguilera tried to communicate with Santa Claran activist Idania Yánez Contreras, we spotted the Chief of the Confrontation Unit Idel, better known as “Railroad Spike,” training a flashlight on Iris through the blinds and carrying a strange device in his other hand shaped like a spray bottle. 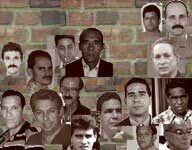 Activist Ernesto Mederos Arrozarena relates that he felt how they sprayed through the window to release the gas,” stated Antúnez in a telephone statement to the Cuban Democratic Directorate. According to Antúnez, this is not the only repressive measure being taken against the protestors. Later the same morning, the exterior surfaces of the home were defaced with obscene phrases painted on in tar and on signs. “We hold the high command of State Security here in Villa Clara responsible for these attempts on our lives and physical wellbeing. Remember that here among us activists there are people who suffer from heart conditions, as in my case, people who suffer from serious respiratory problems, and they are making attempts on our lives,” stated Antúnez. According to Antúnez's report, the operation against the protesters is being led by a specialist brought in from Havana. Read the rest of the Directorate's news releasehere.